We don't have to live with regrets. We can choose to move on and forget; cherish every moment and seize every opportunity. Our outlook will determine the course of our life and we can renew our mind and rediscover the joy of living in the present. When we live with self-awareness and compassion, do as much as and the best we can, then whatever happens, we will have no regrets. We don't have to look back but look forward with hope, faith and confidence. I would rather have a life full of mistakes than a heart full of regrets. My mistakes were from a lifetime of taking chances, making decisions, trying not to be frozen but to grow for the better and pursue my passion. Sometimes we get on the wrong train in our journey we call life, but when we stick to what is good, what is true, what is honest, and what is real, we get to the right and wonderful destination that God has prepared for those who have faith and humility. We may have some regrets, but all we can do is understand and learn from them and then.... put them aside. When we see the world in its true light, we will be able to do good, live pleasantly, contentedly, happily, and when summoned away by our Creator, we leave without regrets. 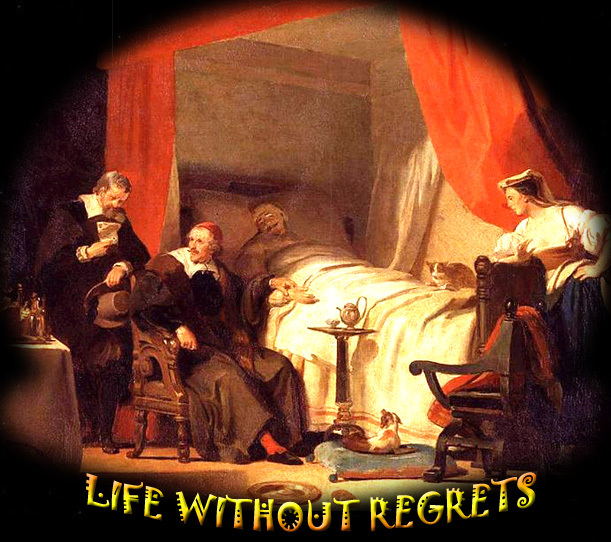 Here's a narrative about most common regrets derived from the book of Bronnie Ware, The Top Five Regrets of the Dying – A Life Transformed by the Dearly Departing. For many years I worked in palliative care (area of healthcare that focuses on relieving and preventing the suffering of patients). My patients were those who had gone home to die. Some incredibly special times were shared. I was with them for the last three to twelve weeks of their lives. People grow a lot when they are faced with their own mortality. I learnt never to underestimate someone's capacity for growth. Some changes were phenomenal. Each experienced a variety of emotions, as expected, denial, fear, anger, remorse, more denial and eventually acceptance. Every single patient found their peace before they departed though, every one of them. We cannot control the reactions of others. However, although people may initially react when you change the way you are by speaking honestly, in the end it raises the relationship to a whole new and healthier level. By choosing the road of life that we have passion on, we can live with no regrets; we can never blame ourselves for making wrong choices because we follow our passion. Life is a choice. It is your life. Choose consciously, choose wisely, choose honestly. Choose happiness.